If you flip on the switch, set the speed and nothing happens, your treadmill is an unhappy camper. Troubleshooting involves putting on your inspector hat and taking a tour of the belt. You may have to proceed to the console if that doesn't solve the matter. If the belt is too tight, it could cause enough tension that the motor can't turn the belt. This is most likely the cause of your belt not moving if you recently adjusted the belt tension due to slippage. Lift the edge of the belt. If you can't raise it at least 2 to 3 inches off the walking deck, the belt is too tight. Follow the directions in your owner's manual for loosening the belt. You will need an Allen wrench to loosen the rear roller adjustment bolts. 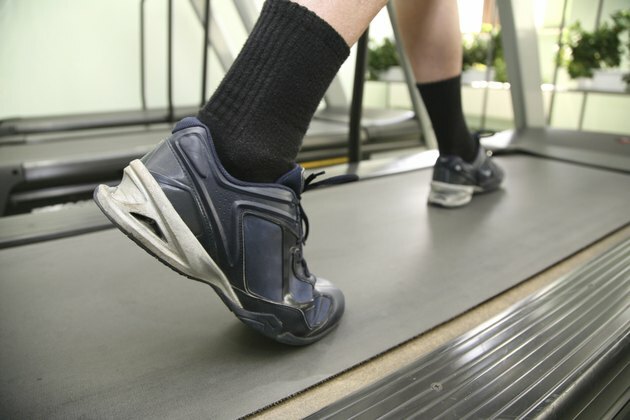 A treadmill belt can shift to the right or left over time. If it shifts enough, this may cause the belt to stop moving. Stand at the back end of your machine and inspect the belt. If it has shifted, you will need to center it by turning the rear roller adjustment bolts. These bolts adjust both the tension and the centering of the belt. Follow the instructions in your owner's manual that explain which of the two bolts you need to tighten or loosen to shift the belt back to the center. Horizon Fitness recommends checking the console wiring if your treadmill belt doesn't move. The console wire connects to the main wire that runs down the inside of the treadmill upright to the motor board. Make sure the connection between the two wires is secure. The connectors usually snap into each other. Disconnect and reconnect the wires. Make sure the wire that runs through the upright isn't pinched or twisted. If the troubleshooting does not get the belt running again, you may have a tight motor belt or a bad motor. You will need to remove the motor hood to access these parts of your machine. If your treadmill is still under warranty, contact the manufacturer for a professional repair. You may void the warranty if you attempt to work on the motor yourself. Why Is My Treadmill Belt Slipping or Skipping?